“Ready Player One” is classic Spielberg at work, brimming with both dynamism and old-school action adventure. First things first — “Ready Player One” is one of those movies you watch for the spectacle. Not for any profound themes, not for any intricately woven plotting, and definitely not for deep contemplation. You watch it for the medley of pop culture, vibrant colors, and explosive action. For pure entertainment. “Ready Player One” is based on Ernest Cline’s polarizing novel of the same name, which honestly, I didn’t like. The book played heavily into the 80s nostalgia factor. Translation: It pretended the only surviving pop culture was from the 80s, and then proceeded to bash readers over the head with it (which many apparently enjoyed). Of course, the clunky prose, long paragraphs listing movie and video game titles, and overall inelegant storytelling didn’t help. So, coming in with extremely low expectations (mentally prepared to suffer for two hours), I was happy to see that director Steven Spielberg’s take was only inspired by the source material. Of course, the basic premise is still shared: It’s 2045, and living in virtual reality is the only thing anyone ever does since real life “is a bummer.” Twenty-seven years from now, America becomes a dystopian future where most of the population has fallen on hard times, so everyone just plays VR games all day. Technology-wise, the VR system that encompasses the movie is very plausible — only a few steps up from today’s platforms. The system in “Ready Player One,” dubbed OASIS, is founded by a recently-deceased character named James Halliday. As his last will and testament, Halliday promised all his wealth and fortune to the player who can find the three easter eggs he’s planted in his VR multiverse. Scruffy protagonist Wade Watts (Tye Sheridan) acts as the audience’s pop culture ambassador, narrating all of this to give the viewers some initial grounding. Then, with dull-but-necessary exposition out of the way, Spielberg finally launches into the good stuff: the hunt for these easter eggs. 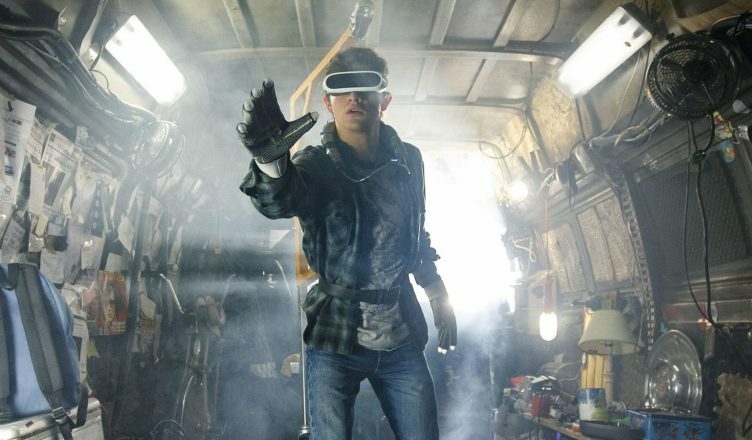 As a story, “Ready Player One” benefits a lot more from the cinematic medium. Where the book contrived long paragraphs of blatant “references” via exposition and corny dialogue, the movie translates all of this into raw visual and auditory energy. We don’t have to read lengthy descriptions of Wade’s car, and how many movies or TV shows it incorporates, we just watch it in action. We don’t have to read on about the varied cultural tastes of his friends, we notice them in the background. As a form of entertainment, Spielberg’s adaptation is already a step up. Coupled with decorated film composer Alan Silvestri’s soaring score and a select choice of songs, it has a very old-school adventure movie vibe. And yet, both the movie and book suffer from the fact that plot is secondary for “Ready Player One”: the story is really just an excuse to mash pop culture together in an extended celebration of nostalgia. This inevitably results in some structural inconsistencies and questionable character choices, but again, depth isn’t really the point. What narrative there is allows for a lot of fun, resulting in a fast-paced action adventure movie that culminates in a surprisingly heartfelt conclusion. The takeaway is this — Spielberg’s “Ready Player One” is a kinetic visual trip through contemporary nerd culture and geekdom. It’s a highlight reel of the past few decades, smashed and condensed into a pulpy, cinematic ride. Even if you don’t get all the references, it’s still a solid time.